send this cookie bouquet just because you are thinking of them. This is the perfect gift for the Oreo� lover in your life. 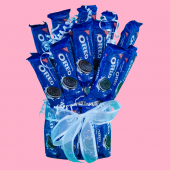 This bouquet explodes with 24 individual packages of Oreos�. That special someone will be thrilled with this amazing cookie bouquet.